Where to Buy New Carpet? 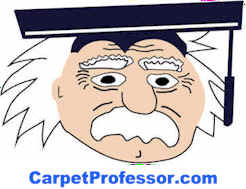 You must select the correct Carpet Padding if you want your new carpet to last as long as possible. Here's what you need to know about choosing the best carpet padding for your home! There are many different types of carpet padding available today in order to accommodate all the various carpet types and styles. In the next few pages I will discuss the various types of pad that you will encounter when shopping for new carpeting your home. But first you need to know a few things about what makes one padding better than another. Carpet Padding quality is always determined by the materials used to manufacture it, the density rating and thickness. A certain type, thickness and density of padding is required by every carpet manufacturer to maintain your carpet warranty. For most residential carpets, a 7/16" thickness is most common. Don't make the mistake of thinking that a thicker pad is a better pad. If you chose a padding that is too thick it can cause wrinkles to develop in your new carpet rather quickly. If so, then you will void your new carpet warranty. In most homes, 7/16" is the thickest padding you should select to keep your new carpet warranty in force. That said, 1/2" thick padding is still a common choice and widely available from most carpet retailers. Read your new carpet warranty. Some folks choose a 9/16" pad for their bedrooms to make the carpet feel super soft underfoot, however this type of padding is getting harder to find these days. Instead, they may opt to have the installer glue together two layers of pad to gain the same result. I don't recommend installing a super thick padding unless you understand the possible consequences. It will certainly increase the chance of developing wrinkles in your new carpet over time and will instantly void your new carpet warranty. However, a super thick padding can be a most enjoyable addition to your bedroom for many reasons. Why not? As Austin Powers might say...Groovy Baby! Looped Berber carpet styles and most commercial grade carpets tend to be more prone to wrinkling and therefore require a special low-profile and high density padding, usually 1/4" or 3/8" thickness, and 8-pound density or higher. If in doubt, you can always call the carpet manufacturer to get the correct padding requirements needed to keep from voiding your new carpet warranty. 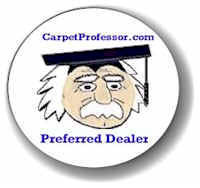 Here is my List of Carpet Manufacturer Phone Numbers and websites. Padding is also rated by its density. Some pads have a low density rating of 3 to 5 pounds and is typically used in apartments because it is less expensive and will be replaced frequently. 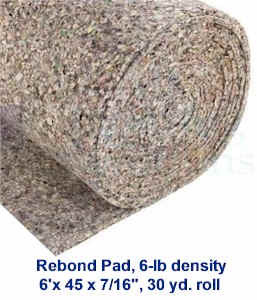 Carpet padding for residential applications usually have a density rating of 6, 7 or 8 pounds, but 10-pound density pads are also available. Some padding types are rated in ounces instead of pounds. For example, 128-ounces is the equivalent of an 8-pound pad. Wool, Felt, Fiber and Rubber padding densities are generally rated in ounces. 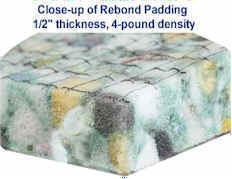 Some folks prefer the 6-pound density padding because it is slightly softer underfoot than an 8-pound pad. However, an 8-pound padding provides better support for your carpet and will generally make it wear better, especially in high traffic areas like stairs and hallways. I prefer the 8-pound density. The higher the padding density rating the more firm it will be underfoot. The higher the density rating, the firmer the padding and the higher the price. Firmer pads provide better the support for your carpet. Better support means a lower chance for wrinkles to form over time. The higher the density rating, the more costly the pad will be. Do not expect the carpet salesperson to choose the correct pad for you, it is your responsibility to make sure the correct pad is selected. If the wrong type, thickness or density pad is used, your carpet may develop wrinkles over time and your new carpet warranty may be voided. It's hard to find a reputable carpet dealer these days! I have built a special list of hand-picked carpet retailers who are locally owned, give free estimates, offer fair prices, have knowledgeable staff, provide honest measuring and hire qualified installers. Carpet padding basics, Carpet padding thickness, Cost for carpet padding, Types of carpet padding, Carpet padding density.